Just because you want a microphone to be hidden doesn't mean it doesn't have to sound good. Audio-Technica's new U851RO Omnidirectional Condenser Boundary Microphone features breakthrough audio and mechanical design innovations, and offersoutstanding speech intelligibility and transparent sound quality for surface-mount applications. Such applications include high-quality sound reinforcement, professional recording, television, conferencing and other demanding sound pickup situations. The phantom-powered U851RO’s small-diameter UniPoint® capsule near the boundary eliminates phase distortion and delivers clear, high-output performance. The unit is equipped with a PivotPoint® rotating output connector, allowing the cable to exit from either the rear or the bottom of the microphone; a UniSteep® filter, which provides a steep low-frequency attenuation to improve sound pickup without affecting voice quality; and UniGuard® RFI-shielding technology, which offers outstanding rejection of radio frequency interference. Self-contained electronics eliminate the need for an external power module. It accepts interchangeable condenser elements in cardioid and hypercardioid polar patterns. 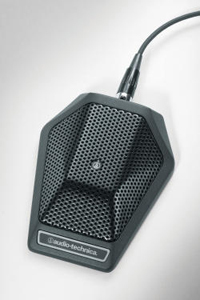 The U851RO features a low-profile design with a low-reflectance black finish for minimum visibility, in addition to a heavy die-cast case and silicon foam bottom pads to help minimize coupling of surface vibration to the microphone. The U851RO’s low-profile element provides a uniform omnidirectional polar pattern with a 360-degree acceptance angle. The U851RO Omnidirectional Condenser Boundary Microphone is currently available with a U.S. MSRP of $313.00. For more information, please visit www.audio-technica.com.